Morphed: Red is not bad. This quilt started out as a project filler. Looking to fill some time waiting on a thread order to finish a quilt on a tight deadline, I dove into my scrap bins and started playing (I had to do something other than hit refresh on the tracking number for 3 days!). I decided to sort the scraps in rainbow color order and then had fun improvisationally piecing blocks. I worked on it here and there and enjoyed the creative process. I loved the improv piecing process for the center of the quilt, but it did not feel complete. I thought a lot about how to best frame the quilt, and when I made the first sample block for a border, the quilt took on a whole new meaning for me. The border made this quilt turn into a jagged stress plot; a reminder of my prior work as a structural analyst. I have always loved rainbows. I delight in seeing them in nature, whether in the sky from rain or cast on the wall from cut glass. I have always wanted to surround myself with rainbows. I got to make some decisions about my room decor when I was around 5 years old: I wanted blue walls (I still have blue walls in my bedroom) and I wanted a rainbow wallpaper border. At tough times in my life, I have seen rainbows and been reminded that there is a larger arc going on in my life. While I might not like or be happy about current circumstances, those moments have reminded me that the sun will shine into the dark places and illuminate beauty. Engineering is a broad and diverse field. One of the reasons I knew I had found my calling and niche as a structural analyst was that the tools I used to perform my job created “rainbow plots“. Over the years, the joy of my job slowly began to be morph. Red was used to indicate areas that did not meet structural margin requirements; hence the saying, “red is bad”. The term “rainbow plot” was used in a derogatory fashion to indicate lack of skill, intuition, or good engineering judgment. I began to modify the way I presented my work; I removed all purples and magentas from my plots (if it isn’t a rainbow color distribution, can they call it a rainbow plot?). Along the way, I lost delight in the beauty of a rainbow. I forgot that the beauty of my work was that I was a light shining into the darkness and working to make things better. Looking for a beacon of hope and encouragement from everyone else, I forgot my own strength. But this quilt found me and reminded me of the beauty I had pushed aside. By adding the border, it might not be the most modern quilt, but (for me) it is one of the most powerful decisions I have made as an artist and quilter. The power this quilt has in reminding me of the sheer joy of seeing a rainbow is liberating. I quilted the rainbow colored areas of the quilt using 50wt Aurifil 3817, a beautiful rainbow colored variegated thread using a very dense straight line stitch. 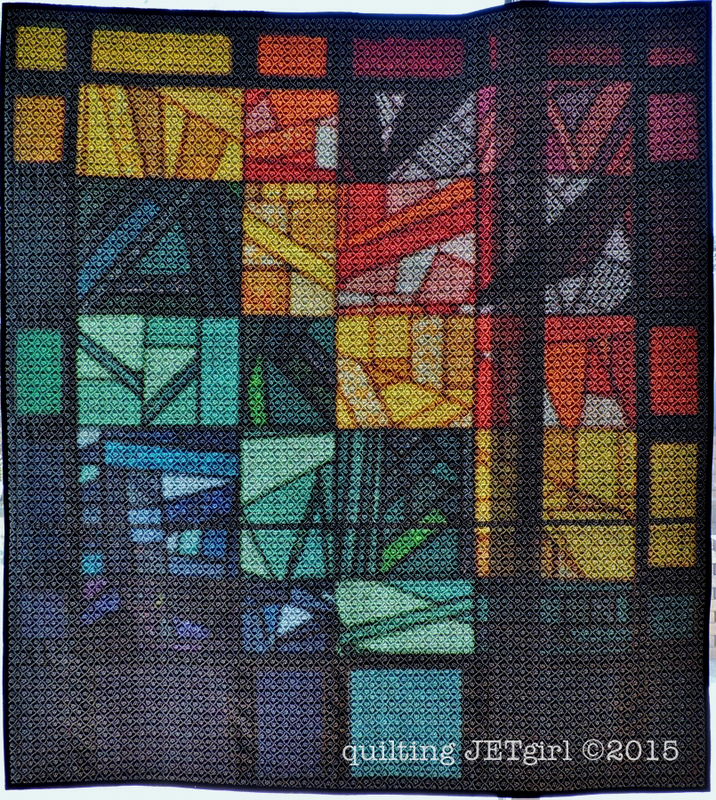 I love the depth it gives to the colors of the quilt up close, and the texture the quilting gives from a distance. I chose to leave the think black borders unquilted as a reminder that darkness is not as impenetrable as it can sometimes feel. The backing for the quilt is another fantastic yardsale find from my mother-in-law. As the quilt came from my stash (and mostly my scrap bin), the yardsale fabric felt like just the right pairing. Due to the pattern of the backing fabric, the quilting does not show up as distinctly until you get close to the back of the quilt, but the quilted versus unquilted areas do look slightly different from far away. I am feeling renewed and reminded of the beauty of childhood freedoms due to lack of adult responsibilities, rules, and constraints. I hope to explore those thoughts and freedoms in more quilting work in the future. SO glad you are rediscovering the beauty of rainbows, Yvonne! The quilt is beautiful and I agree, the backing is great! I love being able to make a project start to finish without having to pull out my credit card!! BTW the picture of the quilt hanging in the window is awesome!! What a beautiful example of how your thinking about color is changing. Rarely is there a tangible product that exemplifies our thought process like this. I appreciate your explanantion of how color influenced your work, and how you identified them with positive and negative aspects. It takes a lot of effort to reassign colors in our work into more positive tools, and I love hearing how you envisioned yourself as the lighthouse. 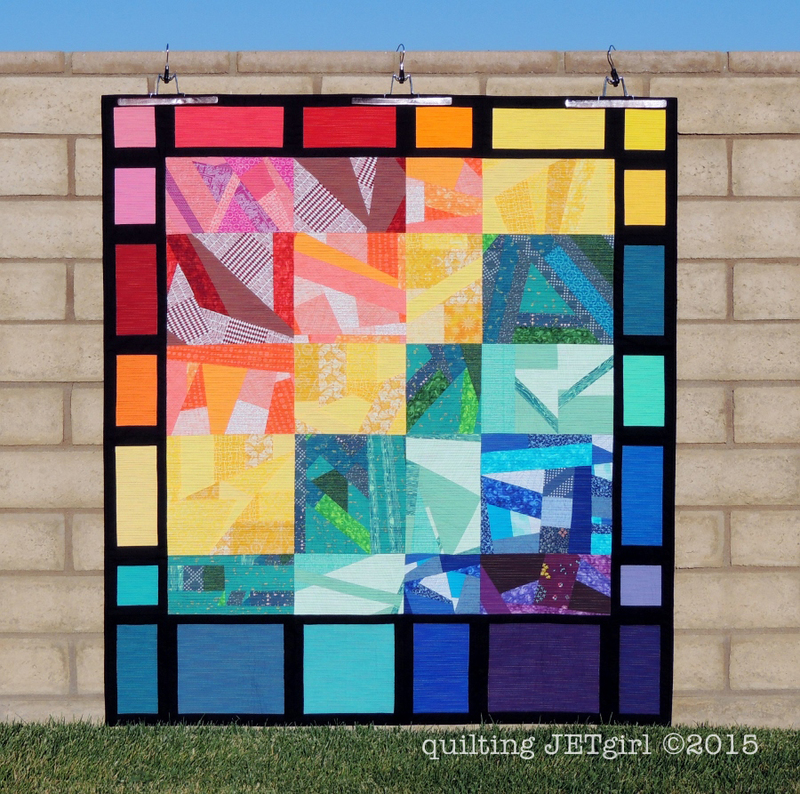 This quilt shows you shining with all your Fresnel lenses casting out the dark in storm. It’s lovely, Yvonne. I love this quilt and all the meaning in of rediscovering rainbows. You have outdone yourself with this quilt and the borders are the perfect addition. It gorgeous! We sometimes get stuck on a color we love and use it often, or would never think of using a color we dislike. I don’t think there has ever been a rainbow (in any form) that I didn’t like and this one is beautiful! The quilting is amazing and perfect (I was so anxious to see what you would do!)! Well done Yvonne…It’s a beauty! Your quilt is beautiful!!! 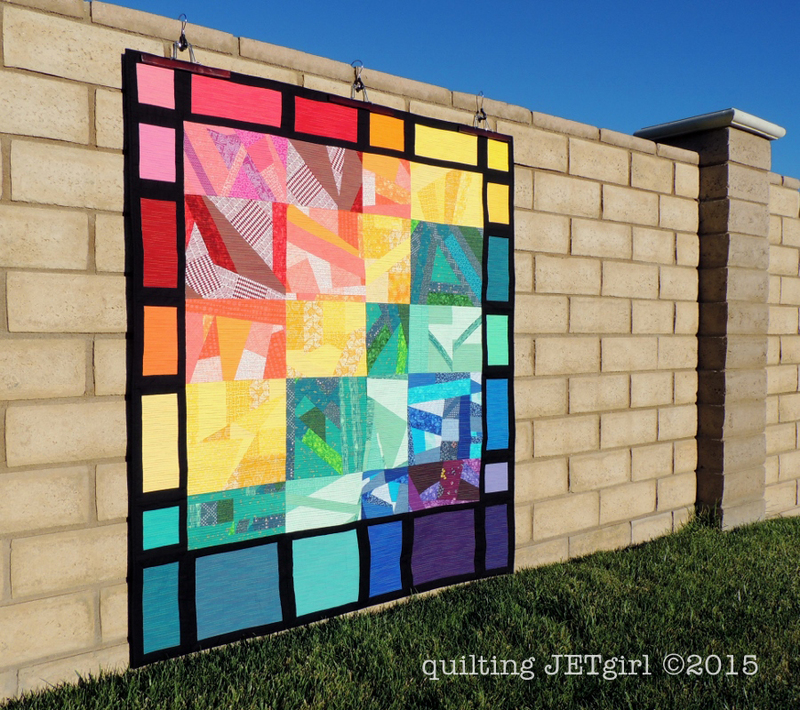 I’m a rainbow girl too, and seeing your quilt in my feed took my breath away… And modern or not, that border is what lifts your project up to a whole new level – from a simple scrap quilt to a multi-faceted piece of art! Beautiful, both your story and your quilt. I really like how you handled the border, with the wider darker bottom to give it weight and anchor it. I think the border does make it modern – it adds contrast and drama and richness – love it! Perfect! I think I’ve said before that I like the quilt–hope I didn’t just think it. I love that the meaning evolved with the quilt rather than having to come first. And I don’t think the border makes it less modern–it is a very modern asymmetrical border. So glad you were able to find the joy in rainbows again. This quilt is a beautiful reminder. Love the texture your quilting gave it and that it was all from stash. I love those pictures with the rainbow shining through on the backside! 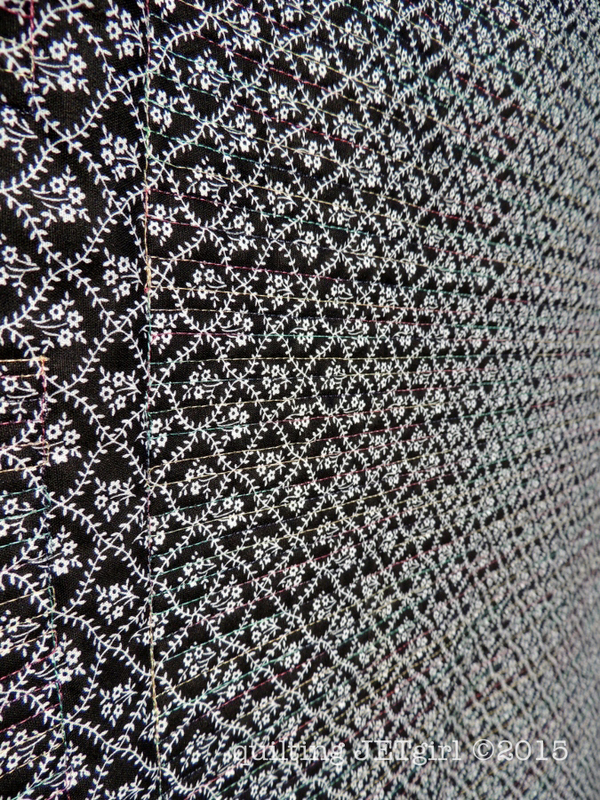 And the close up photo of the quilting on the back is really fun to scroll up and down on. I really don’t think this border counts as traditional, it is very different than most traditional borders. I think if you wanted to call it modern then no know would try to tell you otherwise! I love how this quilt started out as a a little project and then turned into something that meant a lot to you and helped you come back to loving rainbows again! Rainbows are a beautiful bonus to our world! I am glad to hear that you are rediscovering that beauty and pursuing a positive part of yourself that will make you a happier person and artist. 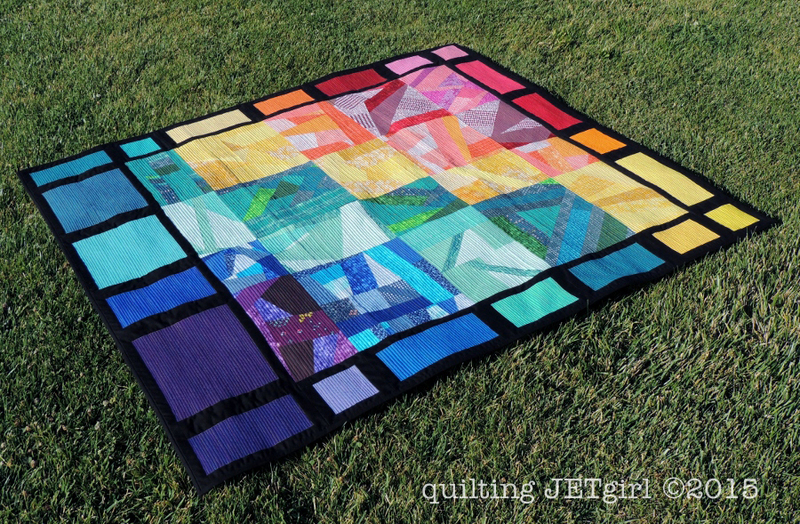 Your quilt is remarkable, scraps work so well together to create a whole. Thank you for sharing your quilt, artistic creation and a part of yourself. Have a wonderful creative day! So often rainbow quilts leave me with a sticky sweet taste but the joyful movement in the improv sections and the strong vibrant border make this a powerful statement of beauty. Love it and all it means to you! Wow, Yvonne. This post is so inspiring and I can totally connect with your story. It’s sad that some careers take the rainbows out (literally OR figuratively, it seems!) – that’s some of my feeling about the way public education has swung in the direction of. I also think your border is very modern! I think there’s a misconception/idea that borders are not modern. They’re modern if you make them modern. The border really makes this quilt stand out! Beautiful work. Oh Yvonne, you moved me to tears. Such beautiful words and a beautiful quilt! Rainbows symbolize so much about hope for me too. For all of us! The “stained glass” shots are so fun. And I pinned your gorgeous reclamation quilt so others can find it too. Powerful story to go along with a powerful quilt. 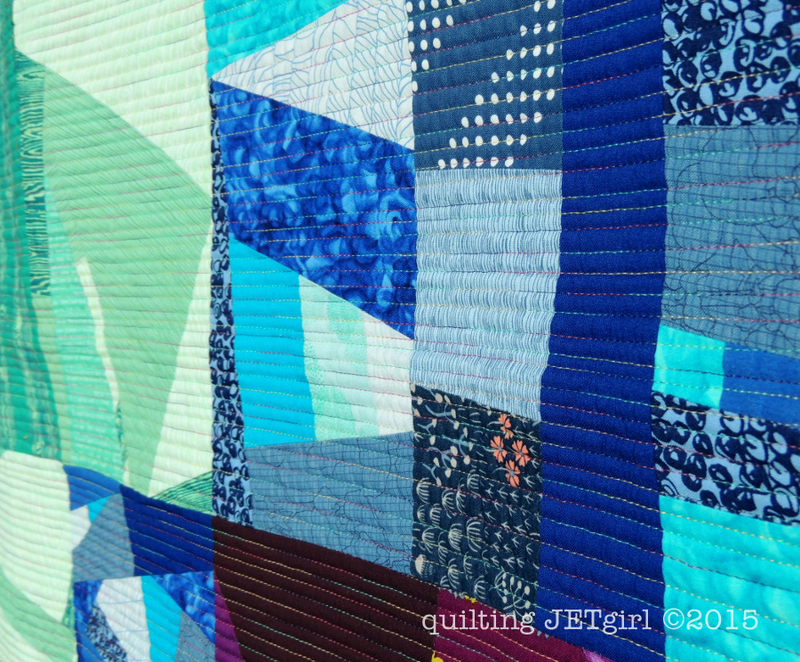 I’m a big fan of these reclamation projects and I’m loving how you’re using quilting as a medium to express these different and hard-to-address parts of yourself. 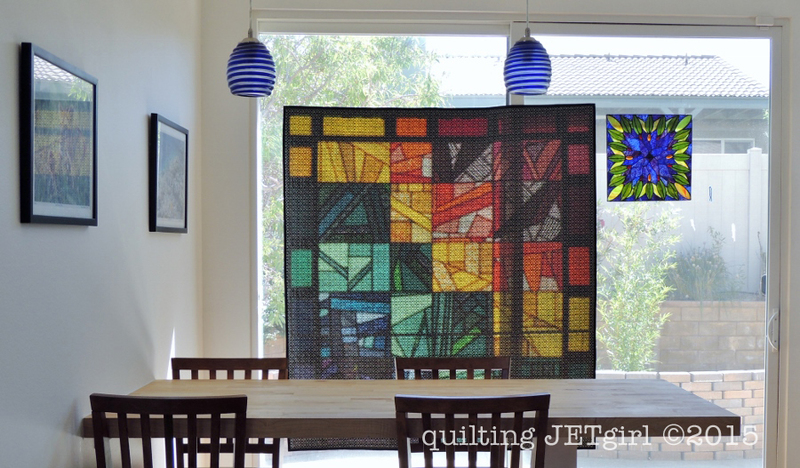 Your reclamation project quilts are some of my favorite things on in the quiltiverse. I love that the playful improv nature of it led to enlightenment and a beautiful piece. I am often saddened by how many things I’ve changed about myself to fit to other people’s feelings of what is “right” or “proper”, and your quilts remind me that it doesn’t have to be that way. Wow!! Pat on the back to you. This turned out so very awesome. You should be very proud. I LOVE the stained glass shots from the back. So pretty. 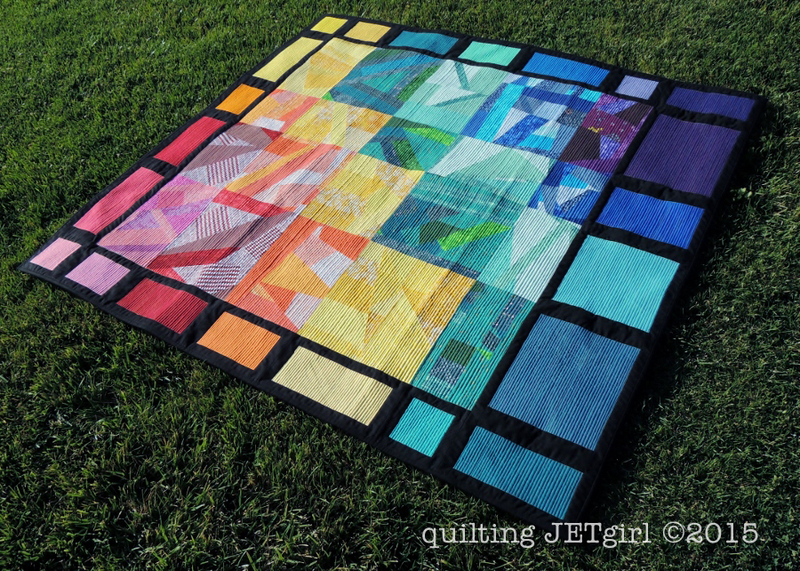 I just love this quilt and I’m not one who gravitates to rainbows. It bothers me that certain colors have either positive or negative stigmas attached to them but what I do know is that there is some sort of beauty in all colors and shades. I just prefer some over others. Stepping outside of one’s color comfort zone is hard but it does open new possibilities. Thanks for the lesson in rainbow thinking. 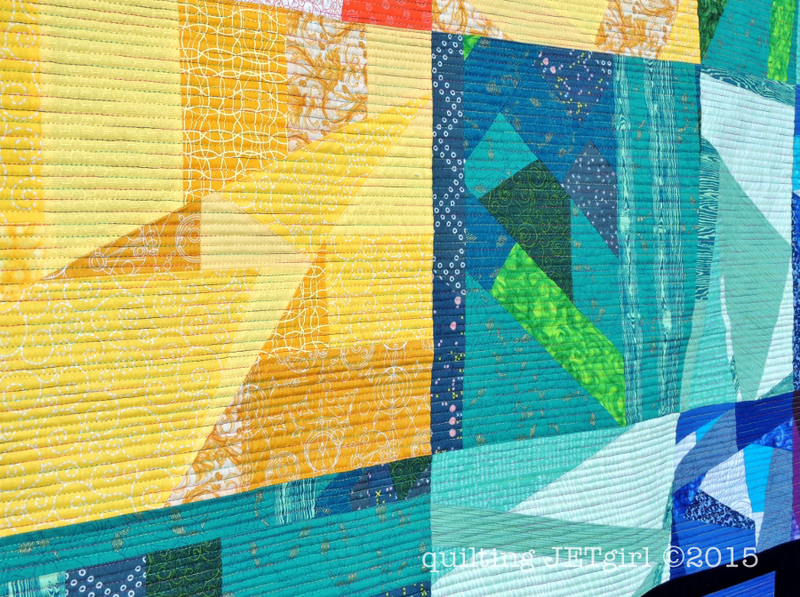 The quilt is amazing–and more so for the backstory that found you as you progressed. I think the border is modern simply because of the variation of widths. And I love how the “stained glass” pictures the show the back and front simultaneously. This an awesome quilt! Glad it did more than fill a need for a Blog Hop!!! 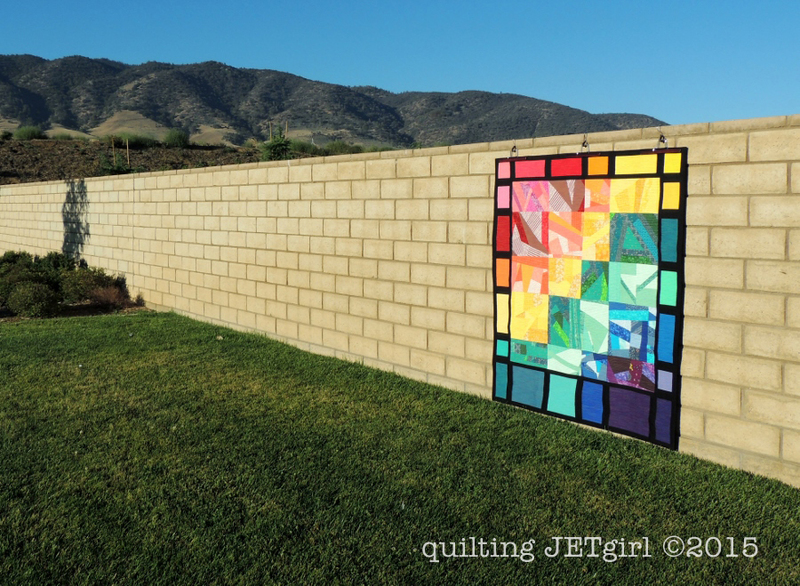 Thanks for writing up the and sharing the genesis and evolution of your quilt. I enjoyed reading your quilt’s story. 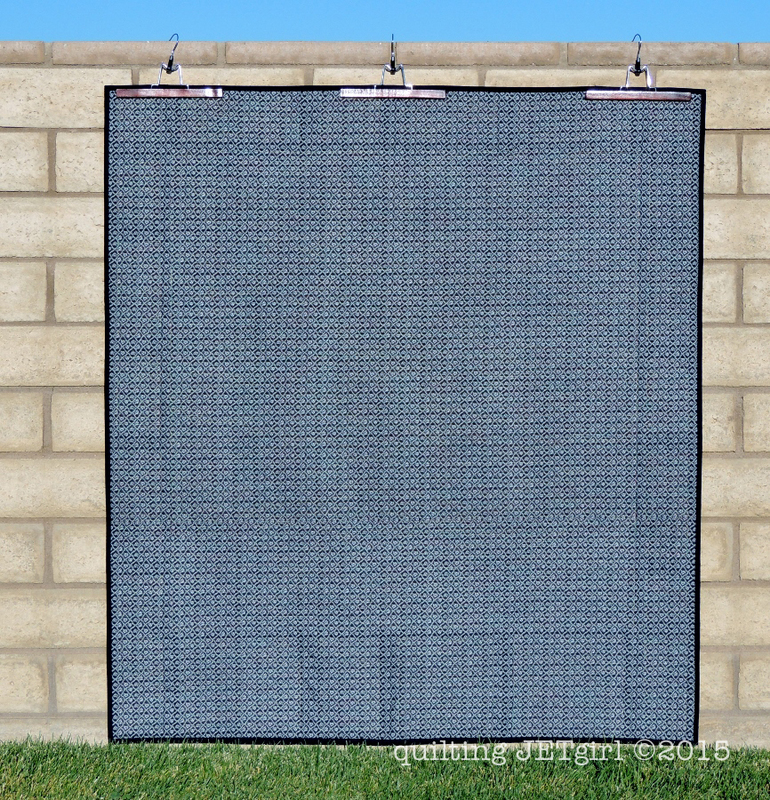 Being pretty new to quilting, I don’t know what makes a quilt categorically traditional or modern and I intend not to form opinions about right design and wrong design. I’m all for mash ups! Beyond adhering the scant 1/4- inch seam rule, I’m using quilting as a space and medium to explore the areas where opposites can exist simultaneously. It’s challenging for me to let go of perfection as a standard for piecing a top. Pulling from my stash and mproving blocks Might be just the exercise I need to practice both letting go while maintaining “proper” seam allowances. Thanks for the lesson, Yvonne. I really love this quilt. Obviously color is an important part of your life or why would you have so many colorful scraps. I, too, use quilting as a way to process through some of my feelings…but never quite to the extent you did here. Thank you for sharing that deeply personal part of yourself. The meaning of “modern” for me, since taking a class from Bill Kerr in June, has shifted from a set of “defining characteristics” (no border, and so on) to a deeper level: the expression of your interpretation of the world through your quilts. This is Bang on. As always, I totally love this series of quilts – not just for the quilts, but for the deeper meaning behind them. Thanks for sharing. You sound like you’re throwing off so many burdens from the past, hope the real, happy Yvonne is truly shining through now just as beautifully as your rainbow quilt does. Great project! I like the dense quilting you added to it. Well done for playing with colors well!